Ecumenical Patriarch Bartholomew and Metropolitan Epifaniy, head of the Orthodox Church of Ukraine, attend a signing ceremony marking the new Ukrainian Orthodox church’s independence, at St. George’s Cathedral, the seat of the Ecumenical Patriarchate, in Istanbul, Turkey. ​The spiritual head of Orthodox Christians worldwide formally granted independence to the Ukrainian church on Saturday, marking an historic split from Russia which Ukrainian leaders see as vital to the country’s security. 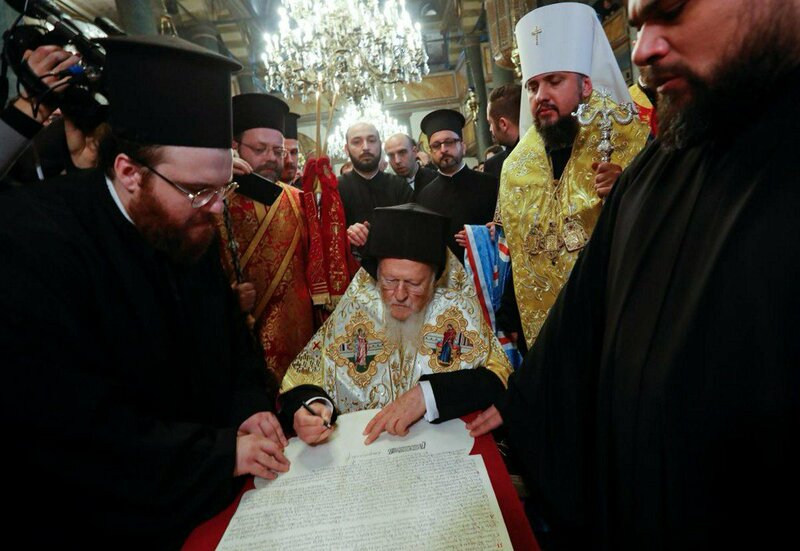 The decree, granting autocephaly,was signed by Ecumenical Patriarch Bartholomew at a service with the head of the Ukrainian church Metropolitan Epifaniy and President Petro Poroshenko in St George’s Cathedral in Istanbul. “Tomos – is just a paper, the result of restless political and personal ambitions. It was signed in breach of canonicity and this is why it has no power”, Vladimir Legoida, the head of the Russian Orthodox Church Synodal Department for Church-Society and Media Relations, posted in Telegram messenger. The church known as the Moscow Patriarchate, aligned with the Russian Orthodox Church, sees itself as the only legitimate church in Ukraine. On December 20, Ukrainian MPs passed a law that could force the church to add ‘Russian’ to its name.